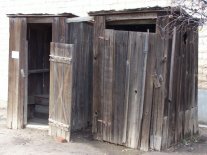 Outhouses have been around since recorded history. Simply, it is a room where human waste is deposited. Two common components are: a building for protection from the elements and a toilet seat. The waste dropped below the toilet seat into a pit or a bucket. A bucket would need to be emptied on a regular basis. A pit would need to be shoveled out on a regular basis if the outhouse is in a set location as in a city. On our farm, where land is plentiful, the house would simply be moved when the pit is full. The pit ranged from 3 to 6 feet deep. It should not be so deep to prevent climbing out if you fell in. Between uses, a cup of ash or lime could be scattered over the waste to reduce the smell. When the level of waste reached about a foot from the top, the house would be moved and the pit covered over. The outhouse needs to be located at least 200 feet from the source of water for household consumption. This would be a well or stream. The modern flush toilet began to be more common in the cities in the early 1800s. Modern sewers with some type of waste treatment began in cities in the 1850s. With the creation of the Las Virgenes Municipal Water District in 1958 water in Calabasas has come from the Sacramento river delta.